As spring warms, the air dances with insects in the new mini orchard meadow and its young apple trees which will soon begin to burst with ‘perfumed wildflowers and herbs and grasses’ (Meadowland – The Private Life of an English Field by John Lewis-Stempel) and apple blossom. There is also a herb garden which attracts many pollinators when it flowers. My garden has been organic for 25 years and I have never used pesticides. Consequently the garden already has high insect diversity which will increase as the new meadow begins to provide more wildflower diversity for pollinators. I use birds and insects as a natural pest control and they are highly effective, the diversity of plants and insects ensures this. 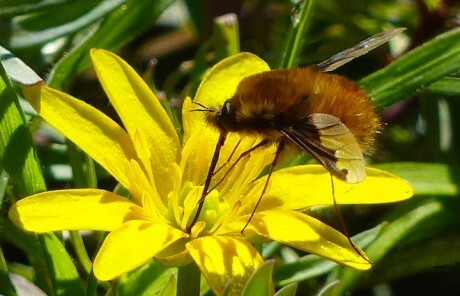 Much to my delight, as I realise the striking Dark-edged Bee-fly should be on the wing, there are three of them in the orchard meadow, feeding on Celandine, Sweet Violets and Primrose. They are bee mimics, trying to pass themselves off as bees with their furry, bee-like bodies. My grandson winces and steps back as one flies near to him. “It’s okay, they don’t sting,” I say reassuringly. But with a pointed tongue as long as its body, it looks like a very feisty stinging insect. So, very understandably, he is not quite certain that his grandmother is right as it flies nearby. The Bee-fly is actually a very cheeky insect, because it does not raise its own young, it flicks its tiny, parasitic eggs into a number of different ground-nesting bee and wasp nests. 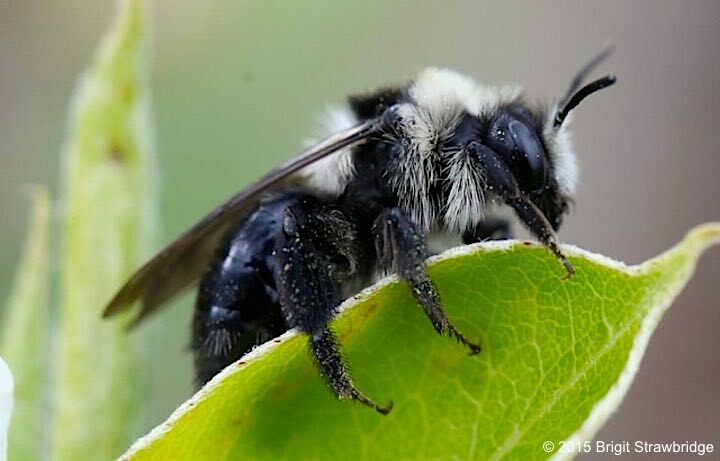 One of the bees is the ground-nesting Ashy Mining Bee which has a very distinctive black and grey body. I saw the first of the year, yesterday, but it disappeared underneath a leaf before I could photograph it. It was wonderful to be able to show the bee to my grandson who was equally fascinated to learn that this small grey and black insect was a solitary bee that does not sting! Earlier this week I saw a spring favourite, the perfectly named, Hairy-footed Flower Bee feeding on Sweet Violets and Cowslips in the mini Meadow. They make a wonderful buzz as they fly quickly from flower to flower in a distinctive angular flight pattern, as the short film shows. 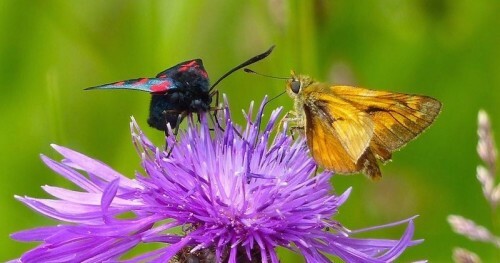 They also feed on Primrose. It is thanks to Brigit Strawbridge’s wonderful blog, Twitter and Facebook sites, that I have learnt so much about bees. There have been a good number of butterflies on the wing this week, including Small Tortoiseshell, Peacock, Comma, Brimstone and Small White. I eagerly await my first Orange-tip butterfly sighting of the year which will be any day now and always invokes the joy I felt in my childhood on seeing one! I have recently discovered that our native wildfowers and plants support an extraordinary diversity of pollinators, birds and mammals. 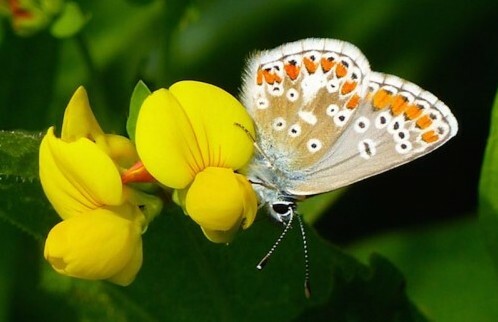 A much loved flower I mentioned in my first blog, Birdsfoot Trefoil supports a staggering 132 invertebrates, such as the Small Blue butterfly and Burnet moths. Another favourite, Common Knapweed supports 67 invertebrates. 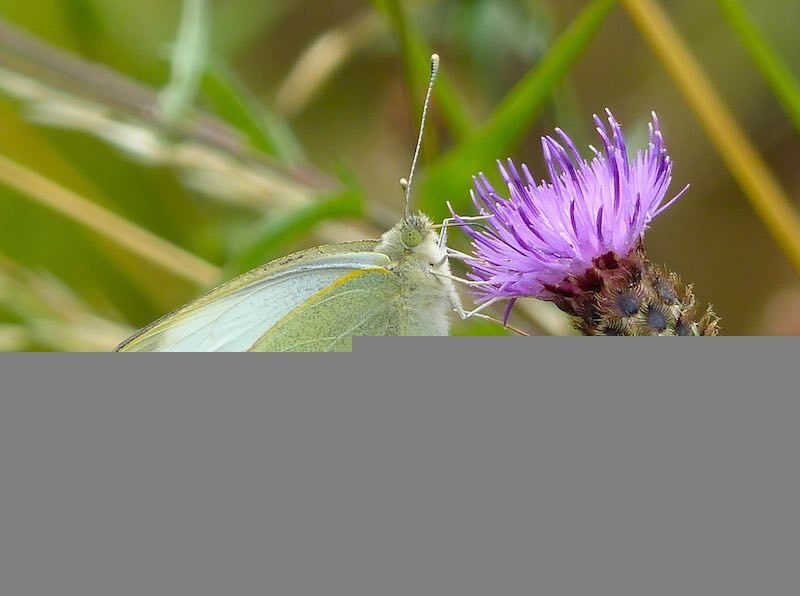 Knapweed wildflowers alone support a staggering 18 butterfly species but biodiversity is key to their survival and the foodplants necesssary for their lifecycle in the caterpillar stage should also be provided, including meadow grasses. I am delighted that these plants are in both my mini meadow and my orchard. No wonder the air dances with insects so vital for our own survival. We hope that you will be inspired to plant native wildflowers in your gardens and start a mini or large wildflower meadow to help our insects. Alternatively, you can sow or plug plant Birdsfoot Trefoil in your lawn as it withstands being mown and looks stunning. You could even start with a metre square lawn meadow. We would be delighted to learn how you get on and to see your photos. For advice please see our Get started page.